Romantic apologies are a way of saying I'm sorry and I love you at the same time. And, like all perfect apologies, saying sorry to someone you love effectively is all about the Art and Science of Apologizing. The Art, in this case, is to take a romantic approach while saying sorry so that it makes the person that you love, feel loved. By adding romance to your apology you let them know how special they are to you, and how sorry you are to have caused them any pain. The Science (the mix of ingredients necessary for an effective apology) remains the same, so below we just focus on some creative ideas for extending a perfect romantic apology. This romantic idea comes from Dave (one of our website visitors) and adds a huge wow factor. 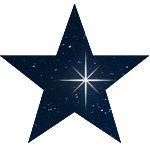 You can name a star through the Online Star Registry (yes, a real star... and name it after the person you've hurt). There are so many romantic ways you can go with this one... Give it to them while apologizing outdoors at night and looking up at the sky. Tell them how sorry you are, how they've always been a star in your eyes, and how now (by naming a star after them) the world will know it too. Read about Dave's experience with this unique romantic idea. Inspired by one of our website visitors whose idea this was, we hired a graphic design firm to put together a package of professional designed apology love coupons. They're brilliant, instantly downloadable and perfectly romantic. Just download....print....personalize and assemble, and you've got the perfect gift for saying sorry that is sure to warm their heart. The fact that you make it yourself makes it THAT much more special! We love the guys at LoveBook—they help you find the words to show your partner why they're so important to you. 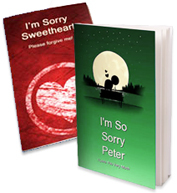 With just a few clicks of your mouse, their online system lets you personalize your own perfect apology LOVE book letting your partner know all the reasons you love them while asking for forgiveness. It's the perfect romantic keepsake to remind you both how special your relationship is and how sorry you are for what you've said or done. We love MyM&Ms®, with just a few clicks of your mouse, you can customize and personalize a gift of M&Ms for your loved one and let them know how sorry you are. With their "Design Your Own M&Ms" feature you can add your own text, an image, clip art, choose from 20 different colors to customize, and finally select from all sorts of unique packaging. It's all done online in about 5 minutes—we love this idea for showing your sweetheart how sweet they really are! Incredible art portraits done with your own DNA. Yes... It's your lips, fingerprints, or DNA as modern art. Simply amazing...and a great gift for a perfect apology. Did you neglect your partner, take them for granted, or have a fight? Then the lips/kiss portrait is the perfect choice for kissing and making up. Or, let them know how much you long to touch them with a fingerprint portrait. The guys at DNA 11 offer 3 different categories of portraits—Kiss, Fingerprint and DNA. They'll totally WOW your partner, be cherished for years to come, and are a great reminder of the love you share. The best part about them is that you can customize the whole thing, choose any color, have it framed or unframed, do it all online and have it shipped just about anywhere in the world. This one is a winner for the guys out there who may have messed up. 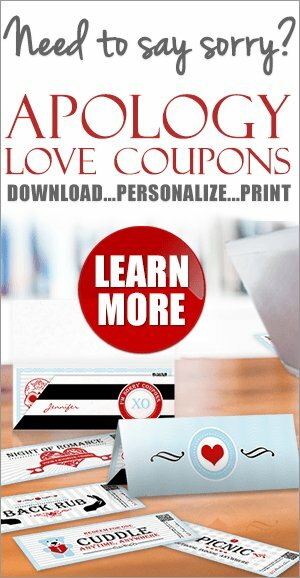 If you're looking for that truly romantic special touch Reeds.com is a great site to explore. They've been in business since 1946 and is completely trustworthy. They offer everything from discount jewelry to designer jewelry like Pandora, to exquisite diamond pieces—ranging from under $100 to hundreds and thousands of dollars—they even have heart-shaped diamonds for those with extra cash on hand. Jewelry really is the "classic" apology gift. As a matter of fact, we were contacted a while back regarding our take on a poll that was conducted in the US. The survey was commissioned by a jewelry company who found that a substantial portion of their customer base purchased jewelry as a way of saying sorry. Apparently, jewelry does wonders when apologizing. Create a custom playlist of love songs. Make the first track on the playlist your apology and dedicate the rest of the songs to your love. Listen to it together in the background while you talk things through. You can use some of their favorite songs, songs you share as a couple, and find others that describe your relationship. Check out some of our best apology songs that you may want to consider adding to your playlist. Is one of you crazy for a band, singer, sports team or the theater? Do you share a special song or spend time together watching sports events? 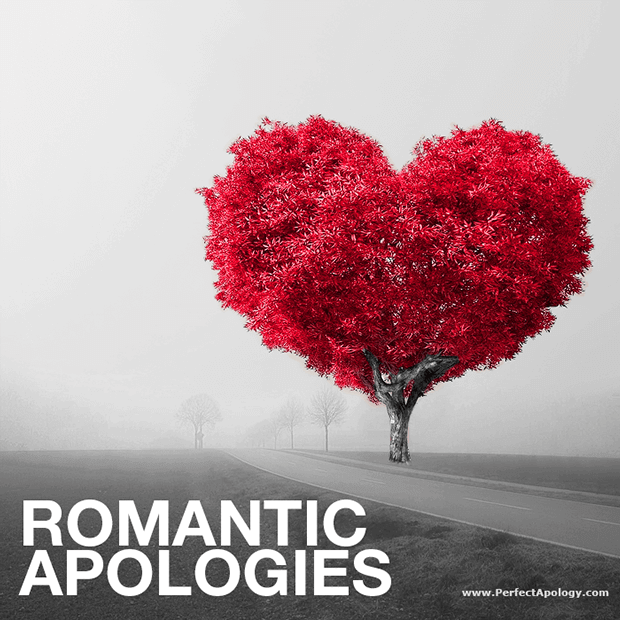 Romantic apologies are about focusing on your relationship and the other person so if there is something in particular that you share together or your partner loves, then find a way to bring it to them by planning a special evening at a concert, show or sports event—it can really become an important memory in your relationship. If you're in the US try the guys at Ticket Network for some great deals and specials. Buy or bake a cake (chocolate's always a good option) and ice it (or have it iced by the bakery) with a personal message from you. "I am sorry and I love you" looks great on a cake. This one's perfect for a girlfriend or boyfriend. Invite them for Chinese food (either order-in or go out to a restaurant) apologize over dinner and arrange to have this special personalized giant fortune cookie appear after dinner. 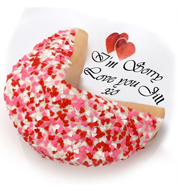 We love the heart shaped sprinkles on top of the dipped cookie which measures almost 18 inches in diameter and 7 high. You can choose between caramel, white, milk or a dark chocolate dip and then personalize your sorry message on a 14" long fortune. This sweet and romantic idea is sure to win back their hearts! 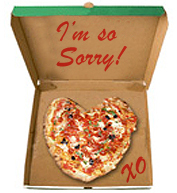 If Chinese food isn't their thing, then have your local pizza shop deliver a custom heart shaped pizza to them along with an apology note. Most pizza places will oblige (when it comes to love people can be so helpful) but if for some reason they can't do it in a heart shape then ask them to arrange the toppings in a heart. Extend an invitation for dinner and apologize. Set up a romantic indoor picnic. Lay a blanket on the floor, light some candles, and serve them their favorite meal (bought or home cooked). Make sure to have several courses to make it a memorable evening and not a quick bite. To 'turn it up a notch' complement the meal with 'traditionally' romantic and sensual foods such as asparagus, oysters, and chocolate dipped strawberries. Hide little I'm sorry notes AND expressions of your love everywhere—in their pockets, in the coffee can, the cookie jar, the butter dish, a cereal box, their briefcase, the glove compartment, their wallet, their shoes, inside their gloves etc... Make some love coupons that they can redeem whenever they want. Have fun with this idea and if you do a good job, your apology and love messages will be found for months and be a constant reminder of your love and heartfelt regret. Give them your heart as a gift. Get a nice box and beautiful ribbon and place a heart shaped object inside, from a small plastic heart charm to a red paper cut-out, to a heart shaped diamond. Any heart will do because it's only a symbol of your love and your love is the gift (not the object). Apologize and let them know that because they're so special to you that you're giving them the most precious thing you could think of...your heart. Need inspiration? Read some of the romantic apology love letters submitted by our readers—they're sure to inspire.